As writer Andrew Van Dam states in a recent Washington Post article, “retail is one of the biggest, most diverse sectors of the economy.” Not only does it vary in types of products sold (i.e. clothing, electronics, and food markets), but also range in size, specialized vs. big-box department stores, and upscale boutiques vs. discount stores. Therefore, it is not surprising that each sector is experiencing different impacts from emerging technology and shifts in the market economy, some are even defying the presumed certainty of the retail apocalypse. While many sectors are struggling to keep pace with the competition, others seem to be thriving and even hiring new employees. According to Van Dam, retail employment only actually decreased 0.4% from 2016 to 2017. As it shows in the graphic below, this is comparatively mild to the hits of the two recessions since the late 1990s. 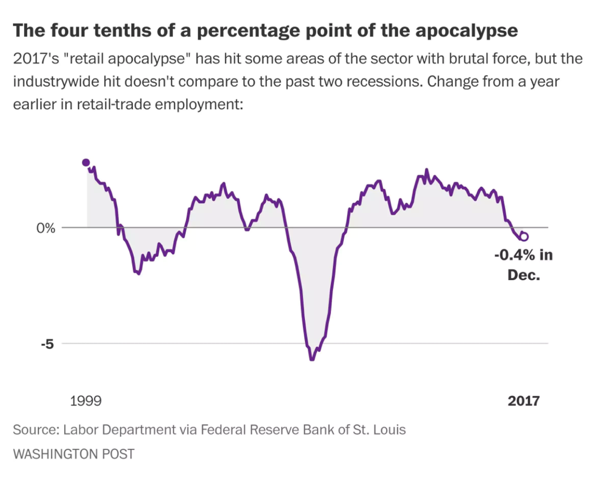 As shown in the graphic above, 4 out of the 5 sectors have been fairly consistent in gaining jobs for the retail economy, both from 2009-2016 and also in 2017. Discount Department Stores, which had previously experienced job loss from 2009-2016, saw an unprecedented spark of job gain in 2017. In general, all five sectors outpaced their job gain in 2017 compared to the aggregated job growth from the last 5 years. In general, there are more retail sectors that experienced job gain in 2017. Still, the total number of jobs that were lost is greater than the number of jobs gained. The top job loss sectors, Warehouse Clubs/Supercenters and Department Stores, lost over 5,000 jobs in 2017. This is nearly the total amount of jobs of all the top job gain sectors. The retail sector lost approximately 66,500 jobs, which is striking given the economy as a whole added over 2 million jobs in that same period. Nationally, these trends may seem relatively minor, but they can have lasting impact local communities. In some communities, job loss in these sectors could mean significant impact to local unemployment rates and the decline in property tax revenue. How will cities that depend on these retail sectors as major employers adapt to job loss or store closings? And while impacts may seem minor in 2017, will this trend continue…should we start planning for a continual decline of retail employment for the future city? The full graph of retail sector job loss and gain can be found here.